Getting into a course isn’t easy, for an instructor or the students. Getting up to speed and into the rhythm of a course takes some time. There’s a whole lot of learning that happens in the first few weeks of any course, but particularly an online course. Getting to know each other, the outcomes of the course, the tasks required, the pain points and gain points, the nature of each individual in the course, and locating everything needed to accomplish the learning. With each course I’ve taught, I take time to get to know the students through a variety of techniques, including a survey before they join the course. With this particular survey response, I can identify those students who are comfortable supporting others in personal computer use in order to build supportive groups in both the LMS and Slack. Using video chats within the first three weeks of an online course is time consuming but beneficial in clarifying understanding and building empathy with the learners in the course. Pre-course surveys may tell me key pieces of information, but not necessarily help me create an empathy map of the learners. 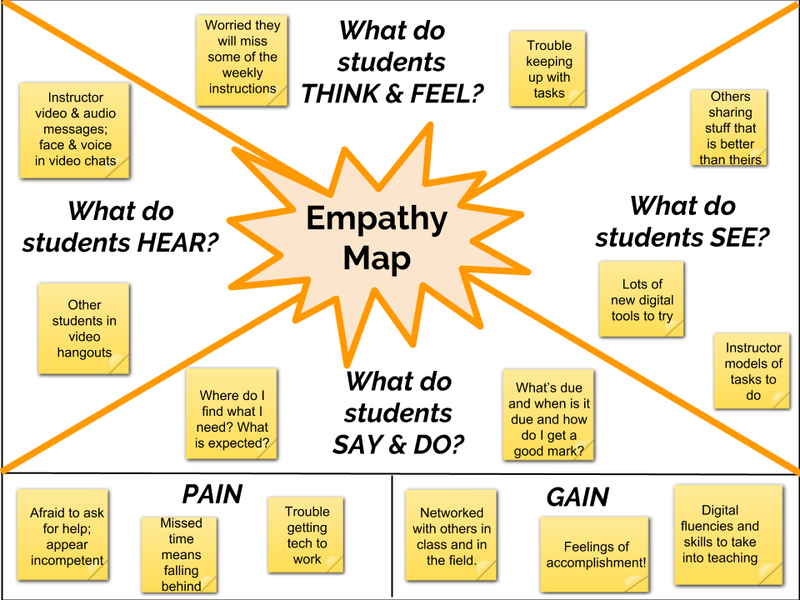 Drafting this empathy map helped me focus on each element of what the students are seeing, hearing, thinking, feeling, saying, and doing. It clarified some pain points and gain points for the online course in particular. This map is not conclusive and may need to be adjusted when I’m able to get additional feedback from those who have taken the course recently.